Classic Style Home: Study Reveal with Bassett Furniture! Study Reveal with Bassett Furniture! I am so excited to show you this reveal! 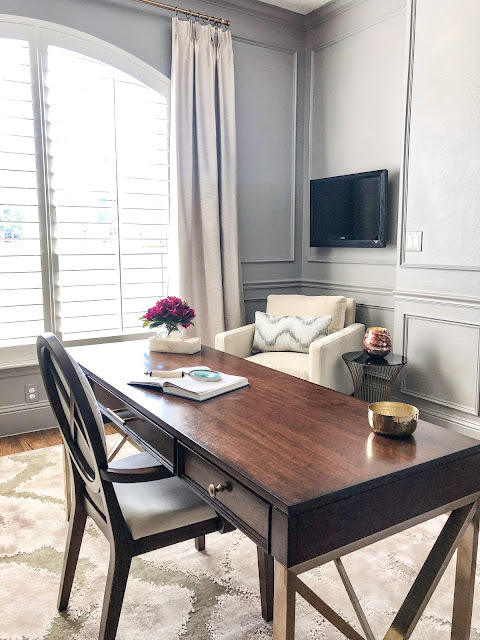 I mentioned I was partnering with Bassett Furniture in this post to makeover my home office. I absolutely love the way it turned out! It's dark, moody, and transitional. Most of my home is light, bright and neoclassical so this look may surprise many of you. I wanted it to feel cozy and a bit masculine since this is where my husband works when he's not traveling. I included his favorite things-a bar cart, a humidor and a TV right across from his desk. He loves working in here, but it has just enough feminine flair for me to take it over when he's not home. I chose this gorgeous desk and credenza at Bassett online, but I was even more impressed when I saw it in person. My dad knocked on the wood and said,"They don't make furniture like this anymore!" I love the transitional lines and updated gold toned hardware. The deep, rich color is perfect for a study. Every masculine study needs a bar cart. All the soap operas have one for the ambiance! Dramatic pause with your back turned is optional. This has become my chair to sit in the evenings and catch up with my husband while he finishes up work. Bassett lets you customize your furniture, from the finishes to the fabrics. I ordered it in a cream velvet to contrast with the dark walls. They also make custom pillows so I was able to pair the fabrics right in the showroom. I love the pop of a jewel tone against the dark gray walls. I chose purple and green in small amounts to give this monochromatic room just a bit more interest. 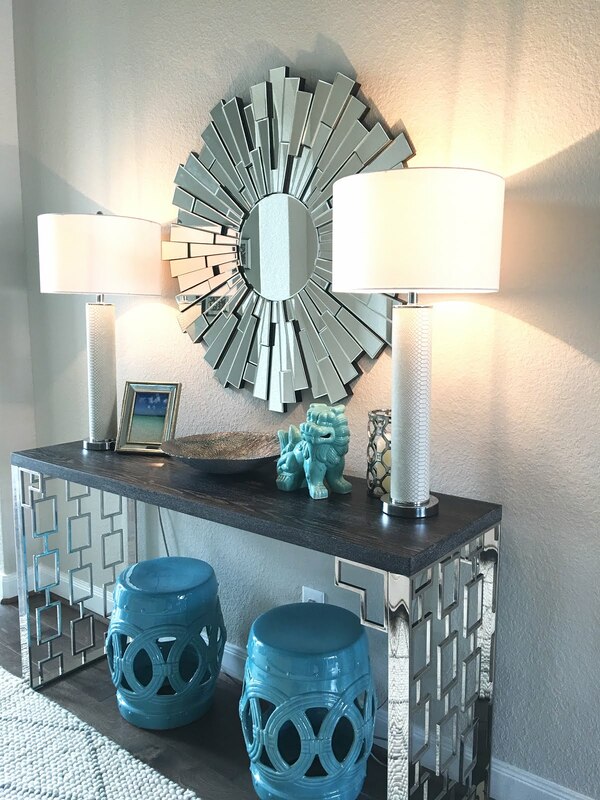 I absolutely love the lamps! Quality lamps can be hard to find at a decent price point. Bassett has so many gorgeous ones to choose from at a great price. Pop over to their showroom for mirrors, art chandeliers and lamps as well as furniture. All the heart eyes for this chair! The geometric fabric is right up my alley as you know. The lines of this chair is just amazing too. The arms fit perfectly under the desk so there's no chipping. Check out the x-back that's mimicked in the legs of the desk. I hope you enjoyed my study reveal! Thank you to Bassett Furniture for sponsoring this reveal, and the staff at the new store in The Woodlands for being so helpful. Second, ask how it comes bundled and if conceivable the heaviness of the bundles so you can choose in the event that you need somebody there at the season of conveyance to support you. That way you'll know early how to get ready for getting the furnishings into your home. I found your this post while searching for information about blog-related research . christian school in east delhi.. It's a good post .. keep posting and updating information.